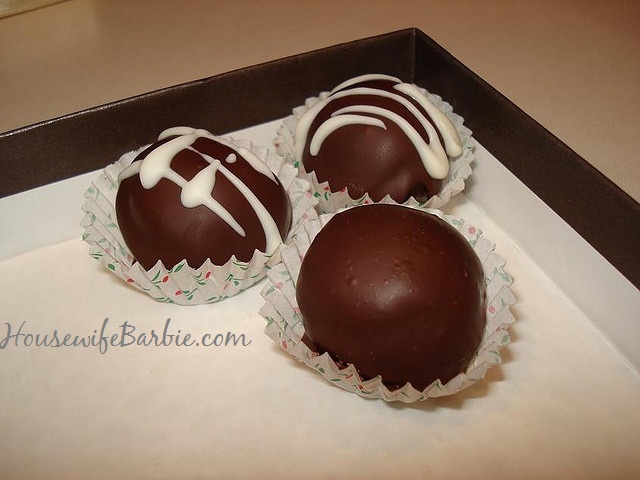 I should probably post some new photos as I make these truffles every single Christmas (and a few times more during the year) - if you've gotten this recipe from me before in previous posts you recognize the photos. These are so incredibly easy and so delicious! In fact, so quick and so easy both my girls have made these themselves since they were early teens. These in the photos were actually made by my 17 year old at the time - she needed very little help from Mom and managed to pull off some beautiful dessert truffles, which we packaged using (recycling) a "chocolate candies" box from Harry & David we had at the house but I'll link to some from Amazon at the bottom of this post too. You can change the flavor of your truffles by using other extracts/oils to whatever taste you prefer.